Being generous, there is an argument that Arsenal�s late glut of goals in the final 20 minutes exaggerated the extent of their dominance. Yet a more accurate summary is that Arsenal were superior from start to finish, played with the cold-blooded intent of potential champions and exposed West Ham United�s defensive shortcomings so clinically that some awkward questions will be asked about Slaven Bilic�s future. While West Ham contemplated the likelihood of a long, dispiriting fight against relegation, Arsenal responded to Chelsea�s victory over Manchester City earlier in the day by rising into second place, three points behind Antonio Conte�s leaders. They drew inspiration from splendid performances from the two maestros in their attack and the quality of their football during that blistering 14-minute spell, when Alexis S�nchez scored a stunning hat-trick, ensured that Ars�ne Wenger arrived for his press conference with a smile on his face. Whether we are witnessing the emergence of the third great team of the Wenger era remains to be seen but there can be no doubt that Arsenal are developing the killer instinct that has so often undermined them since The Invincibles won the title in 2004. Wenger observed that the one regret from the first half was that Arsenal scored only once, S�nchez teeing up the excellent Mesut �zil for a simple finish, and that might have been the start of a lament about needless dropped points in previous seasons. Yet Arsenal�s growing professionalism meant that West Ham�s hopes of an equaliser always looked slim. Any team with serious aspirations of winning the title must beat opponents languishing near the bottom and it was not long before Arsenal were spreading anxiety in West Ham�s defence, seeking to capitalise on the injury to James Collins that forced Bilic to switch from three to four at the back after seven minutes. �lvaro Arbeloa came on for his first appearance since October and the veteran right-back�s rustiness was clearly visible as Nacho Monreal raced behind him on several occasions. Winston Reid alertly denied S�nchez but West Ham were creaking. It was certainly a strange experience to be at a London derby and find such a subdued atmosphere. Gone are the tight, inhospitable surroundings of Upton Park, where visiting teams could usually expect a fierce reception from home fans who acted as a 12th man for West Ham in the biggest matches. With its running track, the London Stadium has none of the old snarl. The empty seats dotted around the home areas were impossible to miss and so was the palpable sense of unease whenever Arsenal attacked, rejoicing in the wide open spaces on the break. West Ham have deeper concerns on the pitch, however, and it exasperated Bilic to see one of his more experienced players gift Arsenal their opener. Angelo Ogbonna�s casual attempt to play out from the back allowed Francis Coquelin to divert the ball to S�nchez, who beat Reid�s feeble challenge before presenting �zil with an open goal. Michail Antonio, Aaron Cresswell, Cheikhou Kouyat� and Diafra Sakho were all unavailable for West Ham but Bilic was not interested in excuses. A point above the bottom three, West Ham cannot fool themselves into thinking that they are too good to go down. It will alarm the club�s hierarchy to hear Bilic say that �the dedication to the cause is missing�. It was difficult to disagree when the stadium announcer began a half-time interview with Marlon Harewood, who scored the winner in this fixture 10 years ago, by joking that �there aren�t many natural goalscorers at West Ham�. Ashley Fletcher toiled on his own up front but there was a warning for Arsenal when the otherwise ineffective Dimitri Payet sent Manuel Lanzini through on goal when the game was still goalless. The Argentinian dithered, though, and shot too close to Petr Cech after a muddled dribble. That chance aside, Cech would do little of any significance until he picked the ball out of the net when Andy Carroll, who made his first appearance since August as a late substitute, headed in the rebound after Payet�s free-kick had struck the woodwork. Arsenal already led 3-0 by that point, though. Wenger had been fretting about his team�s slender lead until S�nchez barrelled past Arthur Masuaku and drove a shot past Darren Randolph, who had no chance when the Chilean beat him with another crisp effort from 20 yards. �He has a killer instinct,� Wenger said. Carroll�s consolation only provoked Arsenal. Alex Oxlade-Chamberlain responded with a fine goal and S�nchez rubbed further salt into the wound when he produced a beautiful dink over Randolph. The home fans who stayed until the bitter end could only marvel at his class. 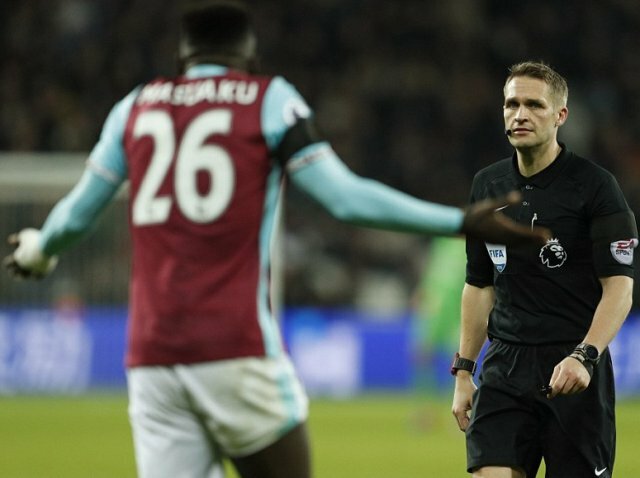 West Ham 3-4-3: Randolph 6; Collins (Arbeloa 7min, 4.5), Reid 5, Ogbonna 5; Fernandes 4.5 (Ayew 63, 4), Noble 5 (Carroll 72, 6), Obiang 6, Masuaku 5; Lanzini 5, Fletcher 6.5, Payet 6. Subs not used: Adrian, Nordveidt, Feghouli, Zaza. Arsenal 4-2-3-1: Cech 6; Gabriel 6, Mustafi 6, Koscielny 6.5, Monreal 6.5; Coquelin 7 (Elneny 88), Xhaka 6; Walcott 6 (Ramsey 66, 7), Ozil 7.5 (Iwobi 88), Oxlade-Chamberlain 8; Sanchez 8.5. Subs not used: Ospina, Gibbs, Perez, Holding. Man of the match: Alexis Sanchez.